Getting started with ham radio can feel a little intimidating. We know. 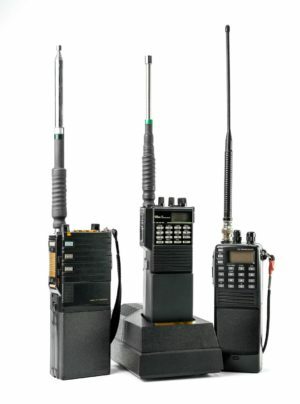 You need not only the right radio equipment, but you are required to be licensed to use the radio frequencies amateur radio operators are authorized to use. The process isn’t as difficult or complex as it might first seem, and there is a wealth of knowledge (and willingness to help!) in the amateur radio community. Here’s a thumbnail sketch of what you need to get started. A Radio. Many people start with a simple handheld radio. A perfectly functional unit can be purchased online for under $100; this 8W dual band BaoFeng handheld is a very popular choice. Different frequencies are assigned to each license class. The Technician rating is the first, most basic rating; the Amateur Extra rating is the most advanced, and allows you use of the broadest range of frequencies. Even the Technician class has sufficient available frequencies however to allow active participation in local radio activities. It’s a great place to get your feet wet in radio. Licenses are granted by examination. License prep can be achieved by self study – many very good books, tutorials and apps are available online; you can also attend classes offered by a local radio club, which often offers the benefit of the instructors personal experience in addition to the core license material. You can locate radio clubs offering classes and approved to give licensing examinations on the ARRL ( the national association for amateur radio) website. Ham Radio School by Stu Turner is an excellent self-study reference for the Technician rating, and is supported by a smartphone app and the full suite of current license test questions. The VARC also offers a Technican level course and is approved to offer license exams at all three levels; the first VARC technician class just graduated in April 2018. On-site classes are a great way to get to know members of your local club while also earning your license. An Antenna. Handhelds come equipped with a stock antenna generally, but depending upon where you live or want to use your radio, as well as the type and quality of your radio and antenna, you may need to upgrade in order to improve your reception. There are some relatively inexpensive options that will increase the distance at which you can pick up a good signal. The N9TAX is a versatile roll up antenna that can be used in a number of temporary configurations and will set you back only about $24. As you can see, equipment requirements to get started in amateur radio are modest and most find that the exam material is readily mastered. Get started today and have your license in just a few weeks! If you need a little more help, or are interested in getting involved with the VARC, please contact us. We’d love to hear from you!